Writer, engineer, environmentalist, community activist living in Detroit. Following the publishing of this article, the May 26th deadline for property reversion was informally extended to June 26, 2015. The result is that the reversions will not take place until then, barring further extensions. As of today, May 26, thousands of Detroit properties will slip soundlessly from private to government ownership through a little-known aspect of the tax foreclosure process known as "reversion." It's all part of the new normal for post-bankruptcy Detroit where the city's debts are forgiven but their debtors are held to the harshest possible standards through water shut-offs and tax foreclosure. Just shy of 20,000 properties were subject to reversion this year. It's not known exactly how many of these actually passed through the process today, but the number includes many thousands of Detroit properties, including many occupied homes. 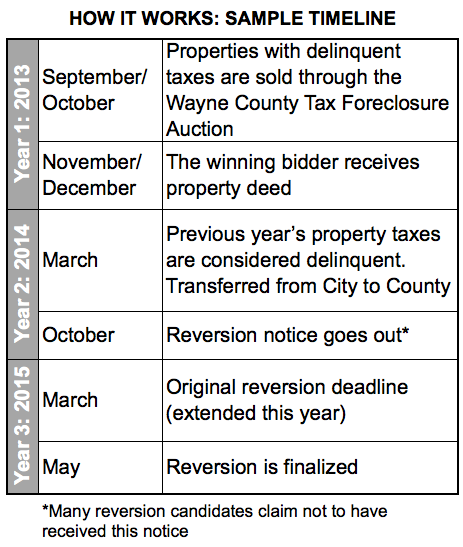 Properties that are sold in the Wayne County Tax Foreclosure auction come with relatively few conditions, other than the [understandable] expectation that this time they stay current on their taxes, lest the cycle of foreclosure repeat itself. Properties that go through this process are held to a higher standard than others, like a parolee recently released from jail. In general, a property will be lost to tax foreclosure only after it falls 3 years behind on taxes. This timeline is cut in half for repeat offenders- a property may "revert" back to government ownership after just 18 months of back taxes. Reversion is linked to the property, not the owner, so an owner is held to these conditions regardless of whether the new owner had anything to do with the original offense. There is logic to this concept, however, due to some charming quirks of the property tax process, wherein owners start off a year behind in their taxes, reversion casts a much wider net than it should. The result is that thousands of properties will effectively be foreclosed upon for trifling sums of money after extremely short timelines, often without proper notice. Over 9,000 of the Detroit properties that faced reversion today owed no taxes prior to 2013 and were only acquired that year. At the time the reversion was issued last fall, those properties owed an average of only $1,780 in taxes. In fact, over 600 of these properties owed less than $500. The reason this process is so shockingly rapid is that a property purchased in the Wayne County Tax Foreclosure Auction is technically already one year behind in its taxes. As a buyer in the auction, the moment you purchase a property you are already delinquent, and you may not even receive the tax notice if you purchased the property through a third party. In effect, a new property owner may receive reversion notice less than a year after receiving their deed. At the end of this process the property will either be auctioned by the Wayne County Treasurer or transferred to the Detroit Land Bank Authority, which acquires thousands of Detroit properties each year. To be fair, many of the properties that faced reversion have since been removed from the process as owners made the relatively small payments to salvage their new homes. On the other hand, the grim excess of the reversion and tax foreclosure process reveals how severely broken the property tax system is. In Detroit, tax delinquency is not necessarily an indication of inability or unwillingness to pay- an owner may pay less to save their house from reversion than they would spend in a month's rent if they lost their home. The difficulty of determining one's tax obligations and navigating the system to pay them, as well as the burden of high volumes of distressed properties on local agencies, mean that many well-intentioned homeowners fall through the cracks. 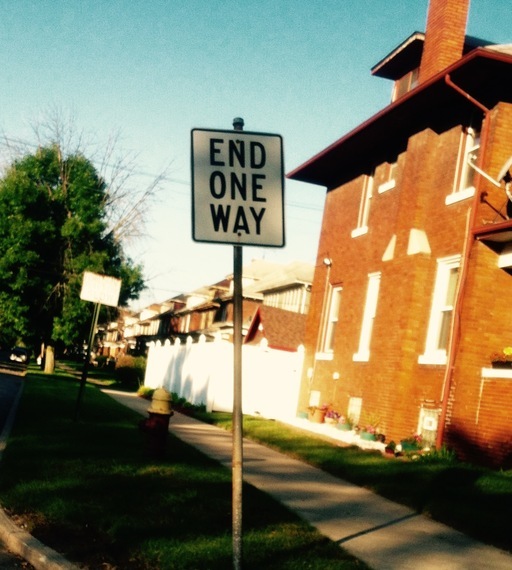 Reversion is one last pothole on the road on the road of property taxes that often ends in human displacement, property blight, and government ownership. Tax foreclosures in Detroit continue to grow to record-breaking levels each year, so the pipeline of reversion properties grows as well. Detroit is a city on the move, but unless it can find a way to support property ownership rather than fight it, Detroit itself risks reverting back to harder times.